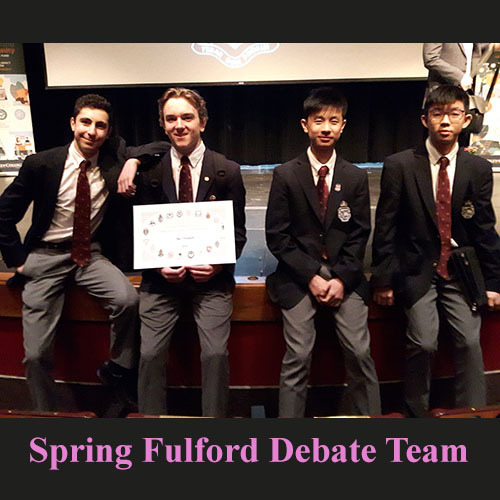 The final Fulford League Debate of the school year was held at Ridley College on April 6th, and Trinity College School debaters finished the competition in grand style. The Fulford League was created in 1948 as a forum for Ontario independent school students to compete against one another, and currently sponsors three tournaments each year. Students are broken into Junior (Grade 9-10) and Senior divisions (Grade 11-12), with Juniors participating in parliamentary style debates, and Seniors in both parliamentary and cross-examination debates. There is also a mix of researched and impromptu debates at both levels. At the spring tournament, TCS was represented by the Senior team of Ben Traugott and Andrew Youssef, and the Junior team of Ambrose Ling and Michael Yip. The Senior team had a great day, placing second. And Ben received a citation for placing fifth among individual debaters. For the season, the Senior debaters finished third overall in the Fulford League. This is a fantastic result, so congratulations to the Senior debaters who participated this year: Ben Traugott, Andrew Youssef, Kyle Munns, Julia Jenkins, Kaitlyn Chan and Jack Zhang.